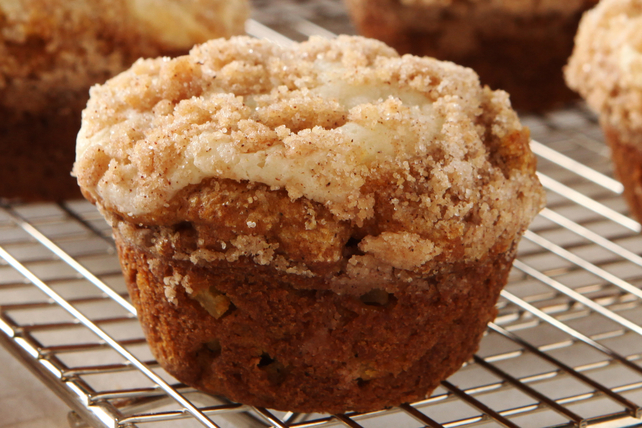 These muffins take a little extra effort but are well worth it. Great for a weekend breakfast, brunch or coffee break! Mix reserved flour, remaining sugar and cinnamon in medium bowl. Cut in margarine with pastry blender or 2 knives until mixture resembles coarse crumbs; sprinkle over batter. Bake 28 min. or until toothpick inserted in centres comes out clean. Cool in pan 5 min. Remove to wire rack; cool slightly. Substitute 1/2 cup golden raisins or chopped pecans for the apple.